This past April I was lucky enough to add Rusty Blackbird, Euphagous carolinus to my life list. Especially gratifying was the fact that I found them (a pair) and identified them on my own. They aren't the easiest bird to find. Rusty Blackbird numbers have been dropping significantly for unknown reason, and can be quite scarce. And if you do happen to come across one it's not the easiest bird to identify by field marks alone; you might not even give it a second look since it resembles a grackle, a bird dismissed by most birders. In fact it wan't the field marks that led me to discover these birds. 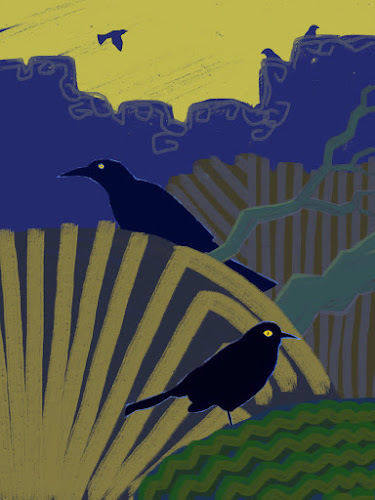 I think ultimately it was my familiarity with the common, everyday birds of the area and season that allowed me to notice these Rusty Blackbirds; a familiarity with the sounds and behaviors of common Icterids like Common Grackles, Red-winged Blackbirds, and Brown-headed Cowbirds. My first clue that an unusual bird was about was hearing an unfamiliar but definitely blackbirdish song. I followed the source of the song to a pair of birds foraging along the ground in an area of planted pines. It was tough to get a good view of them because they kept moving through the underbrush, but their overall "feel" or giss was unfamiliar and kept me watching. There was no particular "a-ha" moment where I realized I was looking at two Rusty Blackbirds. It was just a slow accumulation of sight and sound impressions that led to conclude they were Rusty Blackbirds. Impressions that I could compare in some almost subconscious manner to countless observations of other blackbirds.